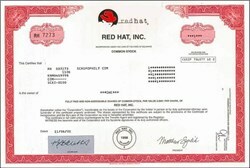 Beautifully engraved certificate from the Red Hat, Inc . This historic document was printed by the Security Columbian Banknote Company and has an ornate border around it with a vignette of the company's Red Hat logo. This item has the printed signatures of the Company’s President and Secretary. Red Hat is the leader in development, deployment, and management of Linux and open source solutions for Internet infrastructure--ranging from embedded devices to secure Web servers. 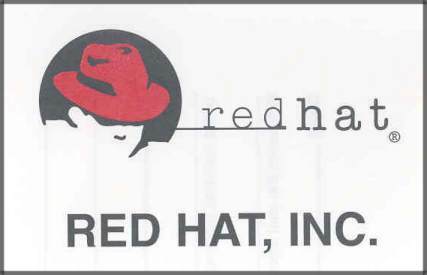 Red Hat was founded in 1994 by visionary entrepreneurs Bob Young and Marc Ewing. Open source is the foundation of our business model. It represents a fundamental shift in how software is created. The code that makes up the software is available to anyone. Developers who use the software are free to improve the software. The result: rapid innovation. Red Hat solutions combine Red Hat Linux, developer and embedded technologies, training, management services, technical support. They deliver this open source innovation to customers via an Internet platform called Red Hat Network. The primary challenger to Microsoft's Windows operating system, Linux has gained acceptance for its speed and flexibility in powering Web servers. On August 11, 1999, the Company completed its Initial Public Offering of six million shares of common stock at a price of $14/share. The stock peaked around $150 in January 2000 and now trades around $8.00.